Many dolls are beloved and faithful companions to the child and with age one may count their many adventures by their stains. Although I personally do not think it is necessarily bad when a doll wears proof of its love and the life it lived so far. And also often the “dolls parents” could not be bothered – because on the contrary kids like the familiar smell, look and feel of their friend but I also do understand the “dolls grandparents” desire to clean their childs favorite doll every now and then. Dolls made of cloth and filled with wool are durable companions who tend to forgive a lot and – unlike plastic dolls – they even can be repaired easily and quickly . But nevertheless one should still keep a few basic things in mind when cleaning a wool stuffed cloth doll in order to guarantee a long live to the beloved friend. Cloth dolls are often filled with (organic) sheeps wool, therefore they do not belong in the dryer! Wool does not tolerate more than 86°F. Also the washing maschine should be your last option – rather try to get the stains out by hand washing the doll. If you can not avoid washing the doll in the machine always choose the wool program without spin-dry. Also avoid drying in direct sunlight or on hot radiators. Please remember: first of all alway try to wash out any ditrying on a small spot with handwarm water only. If the stain is not removed by this you may want to add some mild soap and a brush for stain treatment. You will need: a bowl of lukewarm water, mild soap, a (tooth-)brush and a towel. You should prepare everything you might need to clean before starting. Aside from Water and a towel you will also need a little brush or sponge. Also do not use any “sharp soap”, better use some wool detergent or mild soap. A little baby soap or Babyschampoo will also do. I always recommend to only treat the stained spot and try to avoid to wash the entire doll if possible. Always try to clean the spot with some clear water and a soft brush first. If the stain is persistent you may want to add some mild soap to the water and brush lightly. Rub the wet brush on the soap until it slightly foams. Try to gently rub the soaped brush on the stained spot in circular movements until the stain is gone. You may have to repeat this several times. Try to let the doll dry in between. Finally remove the rest of soap and water with a little bit clean water and a clean dry cloth afterwards. Let the doll dry for 24 hours by room temperature. Caution: Please do not rub too hard on one spot, because it may damage the cloth. Brush carefully with only slight pressure in a movement from top to bottom. Sometimes it is unavoidable – the doll needs to take a bath. Depending on the dolls size, you can clean it in a bowl or sink filled with water. Again, you should first have soap / detergent for wool, a brush and towels ready. You should not wet or wash the dolls hair if you can avoid it. Simply tie the hair up in a bun or use a “shower cap” (made out of a grocery bag and an elastic band). First, you will have to fill a sufficiently large container (bowl, sink) with lukewarm water and carefully put the doll into its “bathtub”. Again, you should first try and treat existing dirt once with some clean water only. Using a brush and lukewarm water, you can now carefully try to rub the dirt out of the cloth. Then you can add some soap or wool detergent to the water. Use a little of the soapy water and a brush to clean soiled areas. 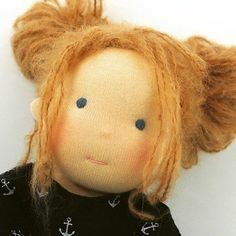 The doll should not soak in the water for a longer time than necessary, because the wool will soon be felting and therefore the doll can get hard and dented. After the doll was cleaned in the soapy water, you can put it into a bath with clean water briefly to rinse the soap off again. Afterwards gently but firmly squeeze the water out of the doll with a dry and clean towel. Keep in mind that there will probably come a lot of water out of your doll, because wool tends to absorb a lot of water! Please try to avoid rubbing the cloth with the towel too strongly, just squeeze it gently and if necessary try to lightly press the doll back into shape afterwards. 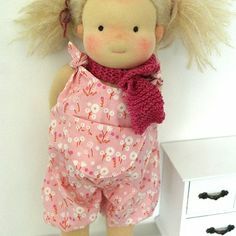 First of gently press the water out of the dolls limbs and then the whole body while still holding it over the bowl / sink, since wool absorbs a lot of water. Apply only slight pressure to dry the doll with some towels and remove the rest of the remaining water. The doll can be dried wrapped in a towel in a warm but slightly breezy spot. Let the doll rest there for about 1-2 days to completely dry. Please do not put it on the radiator or tumble dry! The doll should first dry wrapped into a towel. Later, you should once again change the wet towels. The next day the doll can air dry further. Unfortunately it may be that after cleaning your doll thoroughly its beautiful red cheeks are faded. Here are some instructions on how to simply “freshen up” your doll again. To apply an even thicker layer of paint just rub the cloth over the spot several times. You may also substitute the crayon with a colored pencil- this will result in a more delicate color also it will be more durable. Rub the colouring blocks on the cloth to apply the wax paint. Then you can put the piece of fabric with the paint on your finger and gently apply the color in a circular motion on the dolls cheeks. Start with little color only and then, depending on your taste, for a stronger red add even more color. Gently rub the red paint part on the piece of fabric in circles on the dolls cheeks and maybe also the nose to freshen up the red again. 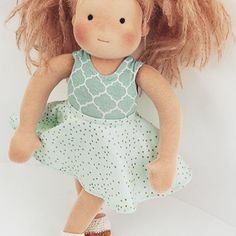 And of course not only the red of the cheeks, but also other parts of the dolls body can be refreshed in the same manner – such as the knees or the belly button, etc. Knees, elbows, nose, navel and buttocks can be touched up with a little red wax paint in the same way. The dolls clothing can be washed with a small amount of wool detergent by the hand wash program of the washing machine. Please do not hurl too strong and iron on low heat level only or allow to air dry. 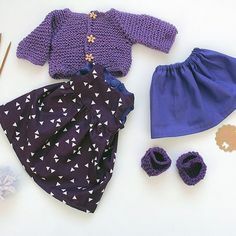 You should always put the doll clothes on all the way from the bottom of the doll, this means from the feet towards the head. If there are any questions or comments, you may contact me via E-Mail.